Fergus Hume was born in England, the second son of Dr James Hume. At the age of three his father emigrated with his family to Dunedin, New Zealand. He was admitted to the New Zealand bar in 1885. Shortly after graduation he left for Melbourne, Australia where he obtained a post as a barristers’ clerk. He began writing plays, but found it impossible to persuade the managers of the Melbourne theaters to accept or even read them. 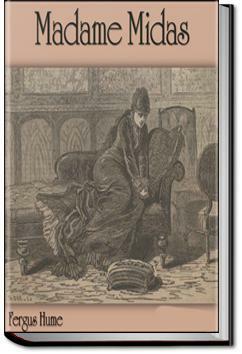 Hume was a capable writer of mystery stories, and may be looked upon as one of the precursors of the many writers of detective stories whose work was so popular in the twentieth century. . . .Oh, my precious mother!' as he climbed up on Slivers' shoulder. 'Then, suppose you go out to the Pactolus and see your wife,' suggested Slivers. 'Bah! you ain't afraid of a woman, are you?' snarled Slivers, viciously. almost all of them are out of print. Interesting murder tale from Hume, not as good as 'Hansom Cab' though, I rather prefer that one... Its quite a good plot with a myriad of intricacies added but I guess this is all for the reader's understanding. This one is a mess. but he reccess to his greed. There is a crime, but the victmim lives, then disappears. The setting changes too much.